I have been asked to do a blog post on my top five things I love about autumn time, I am so sorry to the three people who asked me to do this blog post as I really can't remember who you are. I love love love the crisp autumn air. The sunshine with the cold wind blows lightly on the cheeks of my face, it just makes me happy. Autumn time means no need for air conditioners, fans or heat. It’s the most eco-friendly time of year in that respect. Who doesn't love comfortable cosy jumpers and beautiful designed riding boots? Autumn time for me means getting all my jumpers and boots out in my main wardrobe, and shopping for loads of new ones of course! I don't mean like deep purples and blacks, I mean dark reds, browns and oranges. I love having my nails bright colours all through-out the summer time but once autumn sets in I can't wait to paint them darker colours. And again, of course, checking out new products brands bring out! I am a massive huge mega big fan of the Options Hot Chocolate Range. I have recently been trying their new cherry chocolate hot chocolate and it's such a good little spiced taste, I also love their mint one but my favourite of all time has to be my Belgian hot chocolate by Options. Last but not least, TV time. I love snuggling up either in bed or on the sofa with Daisy, a cosy blanket, a hot chocolate, my candles and fairy lights on in the evening time with the fire lit and watching really good television. Once XFactor starts for me that means autumn and winter time. From XFactor to Downton Abbey, and then onto I'm A Celeb... I love it all! 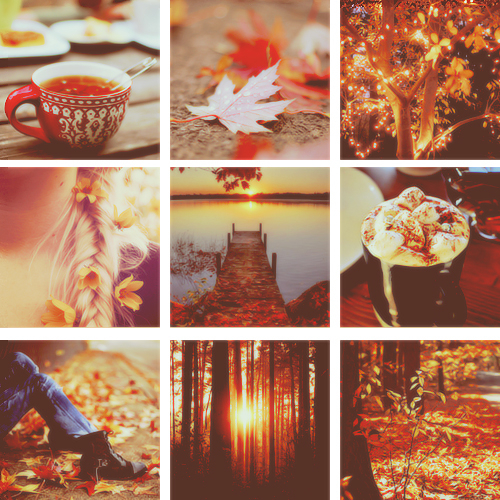 What are your favourite things about Autumn? Let me know below by comments or by tweeting me. Have a wonderful crisp aired day gorgeous!